Nigersaurus taqueti is not new. In fact, this most bizarre of rebbachisaurs has been known since at least 1999, when Paul Sereno named it. Nigersaurus was mentioned ever so briefly in a 1999 Science article called "Cretaceous sauropods from the Sahara and the uneven rate of skeletal evolution among dinosaurs." It didn't get a formal description until 2005, though, when Sereno & Wilson published "Structure & Evolution of a Sauropod Tooth Battery" in the excellent The Sauropods: Evolution and Paleobiology. And even that paper was not a full description--Sereno & Wilson basically muse over its bizarre skull and dentition for 19 pages. A full description of the animal was just published, however, in the free online journal PLoS. This is a signficant step for Sereno, who usually publishes in big name journals like Science and Nature, which are NOT free online. PLoS is, and you should all immediately check out the description. The link is above. What makes Nigersaurus so special is its extremely strange dentition. The muzzle is wide and squared off, and chisel-like teeth are present only at the front of the mouth. The animal has lost its supratemporal fenestrae entirely, seemingly to make room for the orbits, which are enormous and have recessed to the back of the head. The external nares are recessed, but not as much as in its diplodocid cousins. Looking at the skull from the top, it becomes obvious that the tooth-bearing front of the skull is actually wider than the back of the skull. The mandible is roughly U-shaped and, again, the dentaries are ridiculously wide and squared-off. In essence, what Nigersaurus has developed is a perfect tool for grazing. But unlike ceratopsians and hadrosaurs, who cropped their food with a beak and then chewed up the tough plant matter with molar analogues, Nigersaurus was capable only of the cropping. There are no other teeth in its mouth, so cropped plant material would have been swallowed whole. Even if it had the equipment, however, it's not clear whether Nigersaurus would have even been capable of chewing. It's skull is amazingly lightweight, full of holes, and the bones are extremely thin. In the skull and manidble, five accessory fenestrae have opened up. Two of them are in the jugal bone, which itself is already thin and strut-like. The animal's quadratojugal has also lengthed considerably compared to its forebearers, effectively dropping the mandible's articulation. Nigersaurus could open its jaw quite wide. When seen from the side, the skull (with a closed mouth) looks amazingly "open," what with all the large fenestrae and huge gap between the bottom of the skull and the top of the mandible. It looks like a rodent--a rodent without molars. The thickest parts of the skull are the tooth-bearing pieces: the premaxilla, maxilla, and dentary. These bones are full of vascular channels, implying a beak-like structure, which would have further strengthened the cropping structure. Nigersaurus also gives the first reasonably complete endocast of a sauropod. Although I would strongly hesitate to generalize Nigersaurus' brain across the sauropod spectrum (given it's strange skull and habits), it does show that smell may not have been very important to Nigersaurus (its olfactory bulbs are quite small), and that Nigersaurus has an incredibly small brain compared to like-sized ornithischian and non-coelurosaurian theropods. Another area of interest is that Nigersaurus' inner ear suggests that its head was held, so that its muzzle pointed directly downward. This posture may shed light on why its orbits are so large--perhaps it needed good vision to see predators coming from both sides while it's head was among the horsetails. This is not to say that Nigersaurus was unable to lift its neck, but only that it's head came off the spine in such a way that it would have had to bend at the neck in order to "straighten" the head, as my introductory restoration shows. Sereno, et al. suggest that, based on both this new animal and past research by Stevens & Parrish, that diplodocids in general were ground-based feeders. This idea is not entirely unexpected, and the feeding strategies of Diplodocus and Nigersaurus may indeed have been similar. The chisel-shaped dentition of Diplododcus is basically the same (though larger) as Nigersaurus, but Diplodocus had a more rounded muzzle. 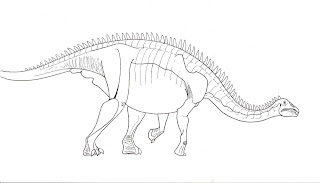 Nigersaurus and its family, the Rebbechisauridae, may simply constitute an extreme ground-grazer. And now we must ask what Nigersaurus ate. Grass has turned up in Late Cretaceous India thanks to some titanosaur droppings, but Nigersaurus lived in the Early Cretaceous of Egypt, so we cannot assume that it was munching on grasses. It would have made an excellent grass-eater, though. Sereno, et al. suggest that, given the animal's weak skull construction and reduced bite force, Nigersaurus consumed horsetails and immature ferns. Since it lived in an area dominated by floodplains and river systems, it's possible that Nigersaurus feasted on shallow-water vegetation as well. I should also mention that its teeth had a replacement rate of perhaps one per month, meaning that this critter was growing new teeth at a near-constant rate, even faster than ornithischians! Wear patterns on the chisel-shaped teeth indicate strong tooth-to-tooth contact, and I can easily see the upper and lower teeth chipping themselves down to nubbins in no time. Is it possible that, like rodents, Nigersaurus' teeth grew at a constant rate so that it always had teeth to grind? I'm not entirely sure how reptilian tooth replacement works. When a theropod loses a tooth, for example, does the old root just fall out and the new tooth erupts within a day or two? And how would it work for a sauropod like Nigersaurus? Aside from its skull, Nigersaurus' skeleton is fairly typical of a diplodocid. It has a short neck, though not as short as Brachytrachelopan! It retains a long tail with rod-like elements towards its end, like other diplodocids. At thirty feet long, though, it's a fairly small sauropod, and I wonder who was hunting it? Nigersaurus is certainly one of the strangest sauropods I've ever seen, and that's exciting. It demonstrates that these big beasties weren't nearly as conservative as we generally think, and it adds to the incredible diversity that the Dinosauria has managed to show off in the last few decades. Sereno, P. C., Wilson, J. A., Witmer, L. M., Whitlock, J. A., Maga, A., Ide, O. & Rowe, T. A. (2007). Structural extremes in a Cretaceous dinosaur. PLoS One (11): published online. Sereno, P. C. & Wilson, J. A. (2005). Structure and evolution of a sauropod tooth battery. In: Curry Rodgers, K. A. & Wilson, J. A. (eds). The Sauropods: Evolution and Paleobiology. University of California Press, Berkeley. Pp. 157-177. Sereno, P.C., Beck. A. L., Dutheil, D. B., Larsson, H. C. E., Lyon, G. H., Moussa, B., Sadlier, R. W., Sidor, C. A., Varricchio, D. J., Wilson, G. P. & Wilson, J. A. (1999). Cretaceous sauropods from the Sahara and the uneven rate of skeletal evolution among dinosaurs. Science 284: 798-800. Stevens, K. A. & Parrish, M. J. (2005). Digital reconstructions of sauropod dinosaurs and implications for feeding. In: Curry Rodgers, K. A. & Wilson, J. A. (eds). The Sauropods: Evolution and Paleobiology. University of California Press, Berkeley. Pp. 178-200. Stevens, K. A. & Parrish, M. J. (2005). 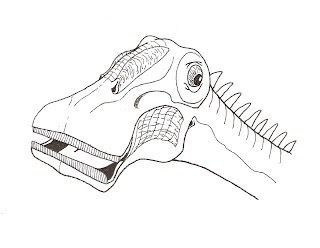 Neck posture, dentition, and feeding strategies in Jurassic sauropod dinosaurs. In: Tidwell, V. & Carpenter, K. (eds). Thunder-Lizards: The Sauropodmorph Dinosaurs. Indiana University Press, Bloomington & Indianapolis. Pp. 212-232. Illustrations by Zachary Miller, 2007. I like the way you illustrated this animal.